"Choli nophel" (falling sickness), was the ancient Hebrew term for epilepsy; "nophel" (present participle of the Hebrew verb "naphal": to fall), 'the falling person', was a popular term in ancient Hebrew for someone with epilepsy. The first book of Samuel mentions Saul's uncontrolled violent behaviour several times. In Chapter 10, it is written: "And the spirit of God came mightily upon him, and he prophesied among them." (1 Samuel, 10:10). Elsewhere in Samuel, an evil spirit from God is talked about which takes possession of Saul from time to time: "Behold now, an evil spirit from God is tormenting you." (1 Samuel 16:15) and two chapters later: "And on the morrow an evil spirit from God rushed upon Saul, and he raved within his house." (1 Samuel 18: 10). 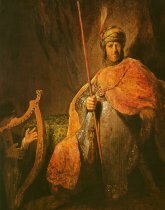 This 'raving' of Saul was the reason why the young David, who could play the lyre more beautifully than anyone else, was summoned to court. Saul appears to have reacted positively to 'music therapy': "And whenever the evil spirit from God was upon Saul, David took the lyre and played it with his hand; so Saul was refreshed, and was well, and the evil spirit departed from him." (1 Samuel, 16:23). "So he changed his behaviour before them, and feigned himself mad in their hands, and made marks on the doors of the gate, and let his spittle run down his beard." This is probably the first time the symptoms of a simulated seizure were ever written down - and King Saul's epileptic seizures were possibly the 'model' for this hysterical seizure.